Andrew Sharp enters his ninth season at the helm of Hesston College Softball on the heels of a school-record 26-win season in 2017. In the season before he arrived, the Larks went 4-26. 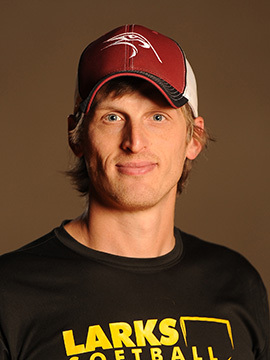 In 2010, his first year, Sharp guided Hesston to a 17-23 overall record. That season, Hesston broke the school record for team fielding percentage and produced the school’s first all-region player since moving to NJCAA, Division II. In 2011, the Larks won 18 games and again broke the team mark for fielding percentage, as well as the overall hits mark. The 2011 team produced two all-region players and two Academic All-Americans. In 2012, Hesston Softball won 23 games, breaking the previous wins record of 22. Sharp’s 2013 team finished with a 16-14 record in Region VI play, good for seventh place among 16 schools. Sharp pitched for the Hesston baseball team from 1997-99, earning an associate of arts degree in May, 1999. He later graduated from Millersville (Pa.) University with a bachelor’s degree in history, and Wichita (Kan.) State University with a master’s degree in sports administration. Coach Sharp is a member of the National Fastpitch Coaches Association (NFCA) and lives in Hesston with his wife, Amy, and their children, Jack and Lucy. 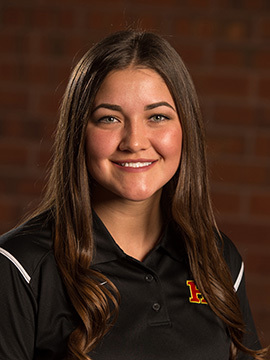 Gabby Willis returns for her second year as a Larks assistant. Willis had a stellar career as a player for the Larks. She ranks fifth in career hits and second in runs scored for Hesston College Softball.